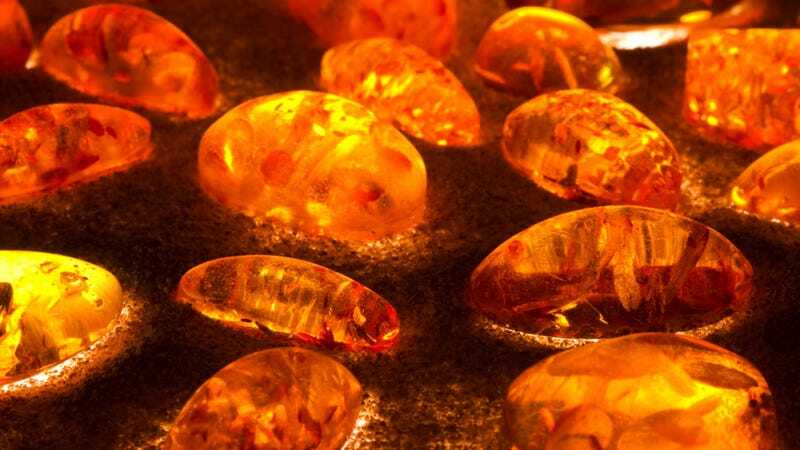 By studying a glob of 20 million-year-old amber, scientists have proven once and for all that glass does not flow. Some people claim that stained glass windows in old churches are thicker at the bottom than at the top because glass flows slowly like a liquid. We’ve known this isn’t true for quite some time now; these windows are thicker at the bottom owing to the production process. Back during medieval times, a lump of molten glass was rolled, expanded, and flattened before being spun into a disc and cut into panes. These sheets were thicker around the edges and installed such that the heavier side was at the bottom. But the myth that glass flows has persisted over time. Part of the reason is that glass is a supercooled viscous substance that was vitrified — a massive change in physical properties in which a first-order phase transition was avoided (unlike the standard solid/liquid/gas state of matter transitions). As a liquid cools, it crystallizes, which increases its viscosity (a measure of its resistance to flow). But when glass cools, it remains stuck in a solid-like state with no crystallization. Essentially, the viscosity of supercooled liquid rises until it becomes an amorphous solid or glass. As is the case with liquids, the atoms making up a glass are not arranged in any regular order — and that is where the analogy arises. Liquids flow because there are no strong forces holding their molecules together. Their molecules can move freely past one another, so that liquids can be poured, splashed around, and spilled. But, unlike the molecules in conventional liquids, the atoms in glasses are all held together tightly by strong chemical bonds. It is as if the glass were one giant molecule. This makes glasses rigid so they cannot flow at room temperatures. Thus, the analogy fails in the case of fluidity and flow. So glass, in this funky state of neither being a solid or liquid, has led some to assume that it’s still potentially in a state of flow. To finally put this idea to rest, Jing Zhao, Sindee Simon, and Gregory McKenna analyzed a 20 million-year-old chunk of preserved amber. They used amber — an organic polymer — because the dynamics of glass persists regardless of whether it’s organic or inorganic. Fossil amber also offers the opportunity for scientists to study glass-forming materials far below typical glass transition temperatures; given its extreme age, it's an ultra-stable form of glass. The team performed a series of calorimetric and stress relaxation experiments on the Dominican amber. They measured its relaxation times (intermolecular rearrangements) at various temperatures, including above its fictive temperature. The team observed that the amber relaxation times did not diverge — meaning that it couldn’t possibly be a kind of fluid. "This result challenges all the classic theories of glass transition behavior," noted McKenna through a statement.